Special Event in October "Let's experience Japanese culture!" 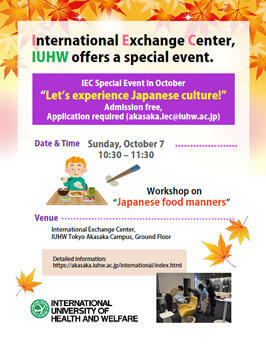 10:30 - 11:30 Workshop on "Japanese food manners"
＊IUHW will also hold the Campus Festival on the day. Please see "IUHW Tokyo Akasaka Campus First Senryosai" (Japanese language only) for more details.